Interestingly, Jason Kottke earlier posted an excerpt from a review of Gosford Park which (perhaps unwittingly) resonates with the later discussion of emergence and blogs/mailing lists/wiki etc. "Altman achieves his dream of a truly organic form, in which everyone is connected to everyone else, and life circulates around a central group of ideas and emotions in bristling orbits." The London ad campaign for the new PS2 game Wipeout Fusion is wonderful. 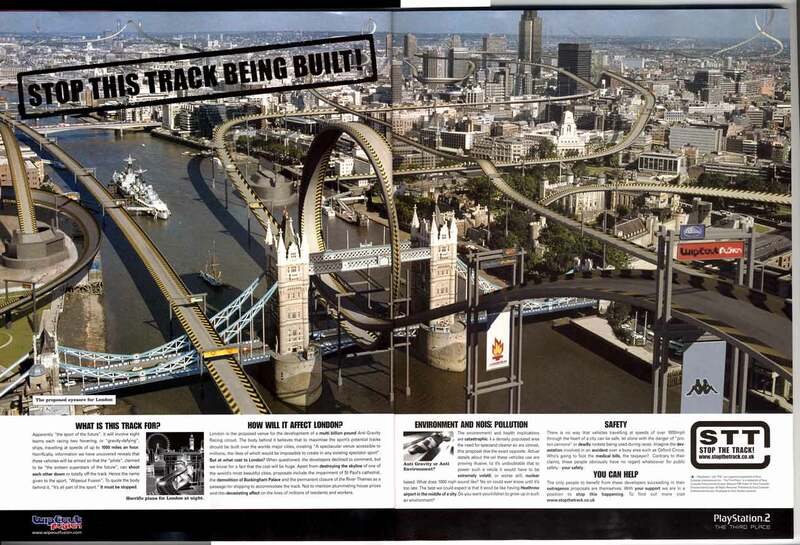 A well-aimed crack at English NIMBYism perhaps, the ad portrays plans for a vast Wipeout course 'imposed' on central London, taking the classic Daily Mail tone but (perhaps reasonably for once) complaining about 1000mph drivers and nuclear fuel disposal issues. Gently satirical, but the course actually looks fantastic! The ad plays best at large scale in various Underground stations (I know Goodge St. has it), but here's a jpg (145kb!) of the press ad (the 'Stop The Track' site seems to have been pulled). The game's been panned a bit by the usually reliable Edge magazine, but urban futurists are probably going to enjoy the game for the cities alone. Like the GT3 tv ad where 'the driver' stops the car mid-race just to admire the rendered scenery.